Liz Fyfe grew up watching her dad become a three-time provincial curling champ, and watched him win the Brier in 1992. She and her brother eventually became competitive curlers, both falling in love with the game. The combination of individual and team play, as well as the numerous components of curling, are what drew Liz to the sport. “It involves so many skills and elements – strategy and mental toughness, physical strength and accuracy,” she said. 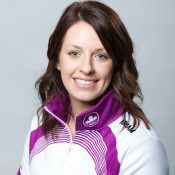 Liz curled competitively throughout her childhood and teen years, coached mostly by her dad, winning the Canadian Junior Championships in 2008. In 2016, Liz and Team Einarson won their first Manitoba Scotties Championship. Liz (the team’s second) was as excited as her teammates to win the Provincial Scotties, and almost as excited as her dad. “It seems like we practiced for 30 years for this day, and I really feel good for her,” said Vic, who passed away just a few weeks after watching his daughter win the Provincial Championship. At the 2016 National Scotties Tournament, Liz won one of the All Star Second awards. When Liz isn’t curling, she works for herself as a wedding planner – which provides many different challenges, just like curling does. She loves planning, décor, lists, itineraries and namely organization. On her bucket list? Liz hopes to travel to Hawaii, and also hopes to someday represent Canada at the Winter Olympic Games.